If you're looking at getting into snowboarding, going for the second hand option is not a bad way to go. Often you'll get lucky and find a board that hasn't been used much at all. If you know nothing about snowboarding gear and have no friends who are boarders then a quick search on Google will turn up plenty of forums where you can get specific answers. You will be pleased to hear that with just a little bit of knowledge you will find it easy to select the right board for you. Try to decide what type of boarding you will be doing. Do you want to be out all day enjoying some all-mountain boarding or are you into speed? Will you mostly be practicing in your local snow park? When you are choosing a used snowboard check the sidewall and sandwich layers to make sure the laminate is not splitting apart. Make sure the inserts are in good condition and that the board has a full set. If you can, go for a board with a cap construction because this type don't have a sidewall, the board is stronger and it flexes better. Another consideration is the effective edge. This is the area of the board which actually touches the snow. For sharper, tighter maneuvers the effective edge should be shorter. The longer the effective edge the more stability the board will have at faster speeds. Make a point of inspecting the top sheet. Be wary of more obvious cracks or "crazing" which you may find more evident in and around the binding areas. Often these indicators will warn you of problems down the line. You will find that most smaller scratches are not worth worrying about unless the aesthetics are really important to you. This is down to your own judgment really. Check the flex. Place the board on a level surface and flex the board to see if it still has a springy feel to it. If it feels dead and soft give it a miss. Also be vigilant for core shots - these occur when the P-Tex material is badly damaged, gouged or chipped. The damage penetrates to the core of the board, hence the name. 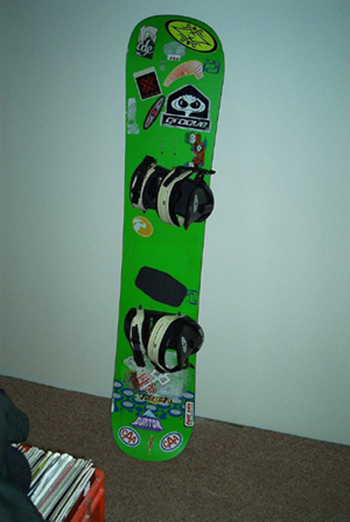 The bindings should not deteriorate as quickly as other parts of the board. You can gauge their condition with a quick manual inspection. You will be able to easily tell if the bindings are past their "use by" date. 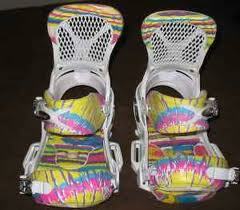 You may be surprised to know that these days snowboards are designed with different specifications for men and women. You should be aware of this when choosing your second hand snowboard. Women tend to be a slighter build overall and on average are shorter than men, so most women will be looking for a smaller, lighter board. The taller female will want a slightly wider board but not too much longer. You can quite easily pick up used snowboarding gear online at places like eBay and other more specialist snowboarding suppliers. However, your best bet if you can is to actually go to a shop and touch the product. 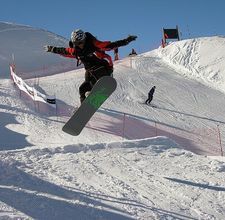 Plenty of snowboarding retailers will have used equipment either on show or out the back. Just ask the proprietors, they are usually more than happy to help.